Anna Comis was born in the ancient Italian village, Casada. For centuries, her ancestors had inhabited the "beautiful little country" surrounded by the Dolomite Mountains. After her family relocated, her parents' stories of their cherished native village continued to connect Anna with her birthplace. Years later, driven by a desire to preserve her heritage, Anna began collecting documents, anecdotes, articles, and old photographs. 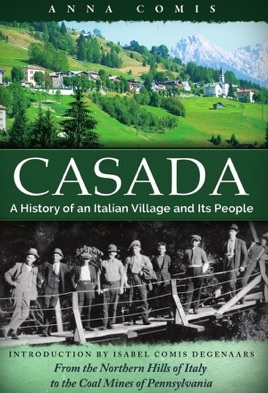 Casada: A History of an Italian Village and Its People contains the fruits of her exhaustive research. Half a world away, Isabel Comis Degenaars also grew up hearing stories of Casada shared by her father, whose parents immigrated to America in the 1920s in search of work and the chance to start a new life. A 2010 visit to her grandparents' ancestral home inspired her to translate her cousin Anna’s book into English. She also relates her own family's challenging journey from the green mountains of Italy into the dark coal mines of Pennsylvania including research of early mining life in the coal patch of Francis Mine. From two cousins separated by distance and culture, comes a rich history of shared lineage set in a land that continues to inspire and haunt those drawn to its verdant hills and valleys. This is a book for those who have been drawn to their heritage -- to their history and their families and to the land in which they came from. It's a book for story-lovers, for Italian immigrants, for anyone who has ever felt pulled to his or her past for unknown reasons. Above all, Casada: A History of an Italian Village and Its People is a book for those who long for a return to a family that seems almost lost now. It is a book for those who wish to return home. Anna Comis was born in Casada, Santo Stefano di Cadore, and currently resides in Pieve di Cadore via Tai. She graduated from the Magistrali di Belluno and subsequently graduated from the University of Padua in 1976 with a degree in literature after which she taught early and higher level education. She has published several articles in the local monthly magazine Il Cadore and has done several interviews for publication in Veneto from the volume Rientro degli emigranti e territorio published by the Istituto Geografico Italiano. After researching her family origins, she published Casada on the occasion of the eightieth anniversary of her parents. Isabel (Belle) Comis Degenaars was born in Old Bethpage, New York and lives in New Jersey with her husband and two children. She holds a Bachelor of Science in nursing and a master's degree in public administration from New York University. Belle is the designated scholar and story collector of her family. She has spent years gathering stories of her father's family, the Comis and Doriguzzi histories, in an endeavor to preserve these memories for future generations. She pursued a similar project for her mother's family: the Knapps, Giebels, and Cullens. With the blessing of Anna Comis, Belle undertook the American version Casada as gift to her father.